Our story of the Authentic Greek Souvlaki Trailer begins with Harry and Dimo growing up in Thessaloniki, Greece. In 2001, Harry landed in Australia followed by Dimo in 2012. 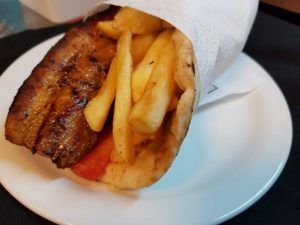 Both boys had their fair share of Authentic Greek Souvlakia* back in Greece and have a list of their favourite soulvaki* hot spots in and around Thessaloniki. Harry loves to cook and entertain, but, on arrival to Melbourne found he couldn’t satisfy his hunger for a smashing traditional Greek-style souvlaki. From that day forward, traditional souvlaki was on the menu whenever he cooked for family and friends. This included his mastered-marinated-mix (even the wife doesn’t know the secret to that! ), tomato, onion, tzatziki and fat-chips fried and sprinkled with oregano!!! Dimo is a jack of all trades and entrepreneur. Intrigued by the growing mobile food industry and being a huge fan of Harry’s souva*, dreamt up Let’s Meat Up Greek Grill. The Authentic Greek Food Trailer. So the boys at Let’s Meat Up Greek Grill will be cooking up a storm on their chargrill with choices of meat such as lamb, chicken or pork belly. Good luck deciding which you prefer, ‘cos it will be a little bit like eeni meeni minie mo!!! You’ll see the shiny food trailer in and around the streets of Melbourne, but if you’re thinking of hosting a private function, charity event or work do – we can come to you too! Have a look at our menu.